Smart Document Solutions Ltd won the ‘Best Network Safety Improvement’ for its introduction of digital pens and forms to replace current paper-based health and safety processes. The digital pen writes with normal ink onto paper, and captures an electronic copy of what is written which can then be sent by mobile phone for immediate processing. Our solution has been extensively used in the Gas and Electricity Industry since 2007 on a wide variety of safety projects, including Compliance Officers inspections, roadside stores order requisitioning and Daily Activity Safe Start audits. Find out more here. This year saw a record number of entries from innovative energy businesses and individual candidates from places including Israel, the United States, Northern Ireland, Scotland, Wales and England. The awards were supported by a host of leading organisations including Northern Gas Networks, Scotia Gas Networks Plc, National Grid, Wales & West Utilities, SSE, Electricity North West, UK Power Networks, SP Energy Networks, Northern Powergrid, EA Technology, The North West Fund for Energy and Environmental, UK Trade and Investment, Earth Capital Partners and the Energy Networks Association. 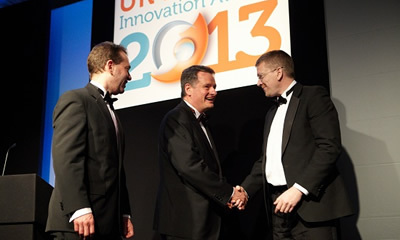 The UK Energy Innovation Awards 2013, created by the Cheshire-based Energy Innovation Centre, celebrated the very best innovative companies working to deliver a low carbon, sustainable and energy efficient future and recognised leading technologies in the energy industry.